SMITH (Smyth), Sir DAVID WILLIAM, army officer, office holder, and politician; b. 4 Sept. 1764 in Salisbury, England, only child of John Smith and Anne Waylen; m. first 1788 Anne O’Reilly, and they had eight children; m. secondly 1803 Mary Tyler, and they had one daughter; d. 9 May 1837 near Alnwick, England. The son of a career soldier and educated under military tutors, David William Smith was commissioned an ensign in the 5th Foot (later the Northumberland Regiment) in 1779. 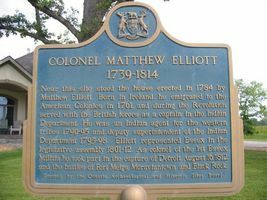 He rejoined the regiment from marriage leave when it was posted to Detroit under his father’s command in 1790. He held a series of regimental administrative posts there and, after the 5th was moved in June 1792, at Fort Niagara (near Youngstown, N.Y.). He also acted as clerk to the Hesse District land board from 26 Dec. 1791 to 7 June 1792. The establishment of the new province of Upper Canada in 1791 did not provide any salary for a surveyor general, it being the view of the secretary of state, Henry Dundas, that the three assistant surveyors employed there could be directed by the surveyor general at Quebec, Samuel Johannes Holland*. 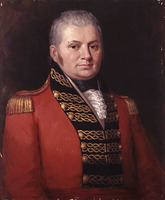 The new lieutenant governor, John Graves Simcoe*, was supported by Holland’s opinion in wanting a separate department for the upper province. Because of Smith’s efficiency on the Hesse land board, and also because he thought the 5th the best-administered regiment in the province, Simcoe made him the unauthorized offer of a post as acting deputy surveyor general, without salary or fees until the appointment was approved. Smith accepted, and when he was at last confirmed as surveyor general of Upper Canada on 1 Jan. 1798 he received back salary not only from 28 Sept. 1792, the date of his commission from Simcoe, but also from 1 July 1792, when his service actually began. His claim for back fees was denied, but he was allowed a small commission on all fees paid through his office. Financially, Smith made a good gamble by serving for over five years with no authorized salary. When he made up his final accounts for audit (to 30 June 1803), his own fees totalled £2,209 14s. 6d. sterling. The land regulations also allowed him and his family to accumulate more than 20,000 acres in 21 townships, 7,800 in Pickering. He was accused of using his office to pick the best land. “The lots marked D.W.S. are sure to be the choice spots,” Lord Selkirk [Douglas*] wrote in 1803. Yet in moving to civil employment Smith was following his preference as well as his advantage. The 5th Foot was noted as a sociable regiment, and at Niagara the beauty and charm of his wife were admired; but he had no taste for the routine and society of garrison life. He was fashionably well mannered, yet by nature reserved, cautious, even suspicious. “I have no Cronys,” he wrote to his Detroit friend John Askin* on 17 Jan. 1793. 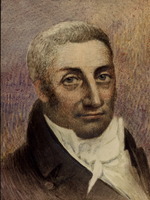 He articled in the law office of Attorney General John White* and was on the first list of licensed attorneys (7 July 1794), but he had no inclination to practise in the courts. He was promoted captain in 1795, but in the same year his father died and in the next his regiment was ordered to Quebec en route to England. As soon as his civil appointment was confirmed he resigned from the army. Although their junior by more than a decade, Smith was with John McGill* and William Osgoode* the most trusted as well as the most energetic and capable of Simcoe’s subordinates. It was his advice that determined the location of townships to be surveyed and opened to settlement. The “U.E. list” of loyalists exempted from land fees was his work; and when that exemption was at length sanctioned by the imperial government on 15 Dec. 1798 its extension to their children followed his proposals. The chequered plan of distributing reserves in townships, adopted on 15 Oct. 1792 and applied almost uniformly throughout the province, was his. It enlarged the area of the crown and clergy reserves from two-sevenths of land actually granted in each township to two-sevenths of the whole township, but it avoided surveying fractions of acres and he argued successfully against White that it met the Constitutional Act’s requirement that clergy reserves be as nearly equal in value to one-seventh of granted land as circumstances would permit. He drafted the first plan for leasing crown reserves, as well as the one actually attempted in 1797. In both he was less concerned about revenue than about reconciling public opinion to the reserves’ existence. The township surveys, conducted by 17 different deputies, were of varying quality, but they were systematically conceived and regularly executed. Orderly surveys did not prevent endemic confusion in land granting. That arose in part from the ineffectiveness of some officials, particularly the provincial secretary, William Jarvis*, who was responsible for issuing title deeds. More fundamental was the inconsistency with which land policy was centrally administered. At first district land boards and then local magistrates could recommend grants, but from 20 July 1796 applications had to be made direct to the Executive Council, on which Smith sat from 2 March 1796. In abolishing the land boards the council reaffirmed the policy of making small grants to all respectable, law-abiding Christians capable of manual labour, but there were such varied expectations about the size of grants that the original plan of 200 acres for a single family, not 1,200 acres, had to be reiterated. Before joining the council Smith had begun an investigation of the grants of whole townships, which Simcoe had naïvely expected to produce organized settlement without fraud of speculation. Of 32 such grants Smith found only six with many actual settlers, and they had often simply moved from other locations in the province. Forfeitures of township grants, which began in May 1796, were difficult because no specific rules for settlement or improvement had been announced until 15 July 1794, and then only for lots along Yonge and Dundas streets. 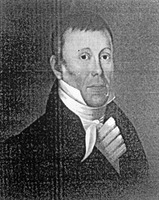 Smith’s relations with Peter Russell*, who was administrator of the province for the three years between Simcoe’s departure in July 1796 and Peter Hunter*’s arrival in August 1799, were not cordial. His wife’s illness (she died in 1798 when only 28) kept Smith aloof from the cliques being formed at Niagara and York (Toronto), although he was considered a social catch. He resented the grudging way in which Russell agreed that he could miss council meetings to attend her sick-bed. The two were nevertheless able to cooperate. The original “Yonge Street conditions” of settlement, gazetted on 15 July 1794, required only actual occupation and the erection of a house on every lot within a year of its location. They were increased in June 1798 to require that five acres be cleared and fenced, and by November 1802 had been extended to apply to most surveyed lands. The vexed question of officials’ shares in land fees was settled, at least for the moment, by a new scale on 1 Oct. 1798; it almost doubled the patent fees, to £5 sterling on a 200-acre grant, but since half that sum was reserved to the crown the officials got less than before. A first attempt was also planned to sell rather than grant land. Smith estimated in 1798 that wild lands were worth from 6d. to 15s. an acre. When two townships were sold in 1800 they fetched only 9d. an acre, barely a third more than the fees on grants would have been. Under Simcoe and Russell the fault in the land system most complained of was the delay in issuing final patents of ownership. 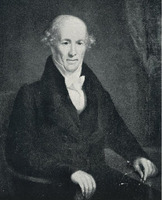 Peter Hunter, zealous for quicker results, achieved a rush of patents in the six years before his death in August 1805 – over 7,000, a rate not matched until 1824. He did so, however, by effectively abandoning the settlement rules that Smith had laboured to apply. Insisting on them delayed fees as well as patents, so they had few defenders in the provincial administration. Smith obtained Chief Justice John Elmsley*’s opinion that ignoring them might be illegal, but when Henry Allcock* succeeded Elmsley Smith had no ally left. On 30 Dec. 1802 the Executive Council set a time limit of three days from its confirmation of a grant for the payment of fees, plus three weeks to take out a patent once it had been drawn up. All that remained of Smith’s plan was a clause in the patent, with no provision for enforcement, requiring three years’ residence. For nearly all his time in Upper Canada Smith was also a member of the House of Assembly. He was first elected on 27 Aug. 1792 for Suffolk and Essex. Although unopposed, he spent more than £233 in treating the electors, whom he never got over calling “peasants.” He was elected again in 1796 for the 3rd riding of Lincoln and yet again in 1800 for Norfolk, Oxford and Middlesex. By 1800 he had changed his electioneering tactics, giving away whisky rather than rum, beer, port, cheese, and roast oxen, but he continued to think of elections as popular festivals not closely related to issues of public policy. “The more broken heads and bloody noses there is, the more election-like,” as he wrote to Askin. He found the first assembly to have “violent levelling Principles,” although all but 3 of its 16 members were either active loyalists or British immigrants. The house agreed to his proposal for a land tax, which the Legislative Council rejected, but it would not accept his motion to have parish and town officers nominated by magistrates. 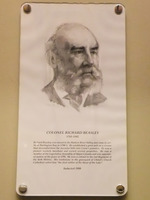 He was convinced that there was a “country party” with republican sympathies and that a “court party” of gentry and officials was necessary to manage the assembly. He was speaker for all four sessions of the second assembly and for the first two sessions of the third, but the relative tranquillity of their debates owed less than he supposed to his management. In July 1802 Smith left Upper Canada. Given leave because of recurrent bouts of fever, he had grown dissatisfied with his position at York. He had found friends there in Elmsley and Scott, but he still thought its society plebeian. And after ten years in the same office he looked to promotion as a welcome change from praise. On an earlier leave in 1799 he had undertaken a little self-advertisement, publishing a topographical description of the province and annotating for private distribution an English translation of a work by François-Alexandre-Frédéric de La Rochefoucauld*, Voyage dans les États-Unis . . . 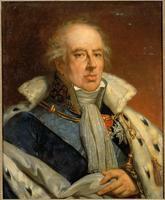 (8v., Paris, ), to meet its criticisms of Simcoe’s administration. He now took many of the papers of his office with him to England, perhaps with the idea of revising his topographical book, of which a second edition did appear in 1813. His hope was for a seat on the Legislative Council. Hunter wanted him back, describing his loss as “almost an irreparable one to the Province,” but was unwilling to meet those terms. He was advised by Elmsley not to recommend the appointment: Smith’s role in the forfeiture of township grants and in attempting to enforce settlement requirements had made him too unpopular with large landowners. Thus disappointed, and having remarried in England, Smith decided to stay there. On 12 May 1804 he gave notice of resigning all his Upper Canadian appointments. They included the lieutenancy of the county of York (held from 3 Dec. 1798), the command of its militia, and a list two pages long of minor offices and commissions. Although Smith had prospered in Upper Canada, he was neither old enough nor well enough off to retire. With both Simcoe and Osgoode professing themselves unable to help, he had no patron in Whitehall. Even a clerkship of works for the Board of Ordnance was beyond his influence. All he could obtain was a pension on the Upper Canadian civil establishment. After nearly a year, however, he found a post, not in public life but as estate manager for one of the largest landowners in England, the Duke of Northumberland, who had been colonel of his old regiment. The returns from the piecemeal sale of his Upper Canadian lands were rather disappointing: about half of them, sold by 1833, brought little more than double his land fees. He had selected good land, but unlike John McGill and John Small* he had not concentrated on locations at York and could not watch the market closely. Still, he was able to buy a handsome property near Alnwick and to settle into a second career longer and happier than his first. [David William Smith issued A short topographical description of his majesty’s province of Upper Canada, in North America; to which is annexed a provincial gazetteer (London, 1799) to accompany A map of the province of Upper Canada, describing all the new settlements . . . from Quebec to Lake Huron, which he compiled; the map appeared in London the following year. A second edition of the description and a new map were issued there in 1813, and the gazetteer portion alone, with a new appendix on Lower Canada, was published as A gazetteer of the province of Upper Canada . . . (New York, 1813). There is also an 1813 New York edition of the accompanying map. Smith’s replies to La Rochefoucauld appeared in the form of manuscript annotations in his copy of the 1799 Henry Neuman translation, Travels through the United States of North America, the country of the Iroquois, and Upper Canada . . . (2v., London, 1799), 1: 380–591 (the portion concerning Upper Canada), and in the form of “Notes upon Mr. de Liancourt’s Travels in Upper Canada, by an Anglo-Canadian,” appended to the same book. 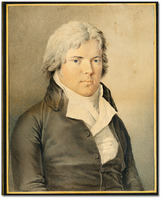 Both have been published as “La Rochefoucault-Liancourt’s travels in Canada, 1795, with annotations and strictures by Sir David William Smith,” ed. W. R. Riddell, AO Report, 1916. Apart from three items – Riddell’s introduction in the AO Report; “David William Smith: a supplementary note to the Canadian election of 1792,” ed. C. C. James, RSC Trans., 3rd ser., 7 (1913), sect.ii: 57–66; and S. R. Mealing, “D. W. Smith’s plan for granting land to loyalists’ children,” OH, 48 (1956): 133–37 – secondary accounts treat Smith only incidentally. The most useful is S. G. Roberts, “Imperial policy, provincial administration and defence in Upper Canada, 1796–1812” (d.phil. thesis, Univ. of Oxford, 1975). See also Gates, Land policies of U.C., which does not entirely replace G. C. Patterson, “Land settlement in Upper Canada, 1783–1840,” AO Report, 1920; A. F. McC. Madden, “The imperial machinery of the younger Pitt,” Essays in British history presented to Sir Keith Feiling, ed. H. R. Trevor-Roper (London, 1964), 173–93; T. D. Regher, “Land ownership in Upper Canada, 1783–96: a background to the first table of fees,” OH, 55 (1963): 35–48; and J. H. Richards, “Lands and policies: attitudes and controls in the alienation of lands in Ontario during the first century of settlement,” OH, 50 (1958): 193–209. Smith’s life is best documented in his own papers and in his correspondence with John Askin, John Elmsley, and Thomas Scott, with scattered references in the papers of some other contemporaries. Relevant collections include the D. W. Smith papers and John Elmsley letter-book at the MTRL; the Peter Russell papers (MS 75) and Simcoe papers (MS 517) at the AO; and the John Askin papers (MG 19, A3) and Peter Hunter letter-books (MG 24, A6) at the PAC. There are helpful printed collections: Corr. of Hon. 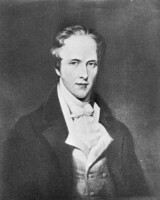 Peter Russell (Cruikshank); Corr. of Lieut. Governor Simcoe (Cruikshank); [E. P. Gwillim] Simcoe, The diary of Mrs. John Graves Simcoe . . . , ed. J. R. Robertson ([rev. ed. ], Toronto, 1934); John Askin papers (Quaife); and Town of York, 1793–1815 (Firth). S. R. Mealing, “SMITH, Sir DAVID WILLIAM,” in Dictionary of Canadian Biography, vol. 7, University of Toronto/Université Laval, 2003–, accessed April 24, 2019, http://www.biographi.ca/en/bio/smith_david_william_7E.html.